Moving time: 5 hr 55 min. Wind: South wind all day long. It started out at 5 mph but grew to 15 mph by the end of the ride at 3:300pm. Cross wind all day. Weather: 70°F (21°C) in the morning; got up to 96°F (36°C) by the end of the ride at 3:30 pm. Just like yesterday but warmer with sparse clouds. Boy, it was hot today. There was cloud cover during the past few days but today it was perfectly clear. The UV index was high and I went through a lot of sunscreen. 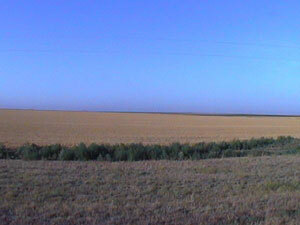 Here is a shot of the flat prairie just after dawn. 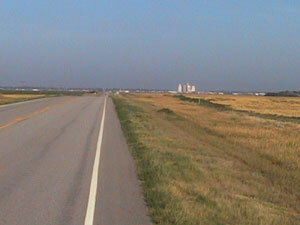 The first picture below is of Scott City from about five miles away. The grain elevators can be clearly seen from about 15 miles away and the towns grow up around these elevators. 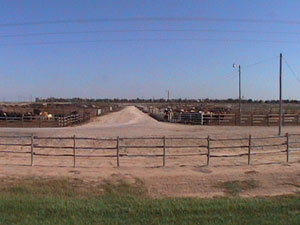 The second shot is of a feed lot that is a common sight around here. It's nice to see them unless they are on the south side of the highway when the winds blow that wonderful smell of thousands of head of cattle toward me. It turns out that the growing season is done early here in the high plains. A few fields still have corn but are heavily irrigated. Hay is cut nearly year round here as well. The common crops are soybeans, wheat and other grains, and corn. This has been a particularly dry season - they only received six inches of rain in the past six months. 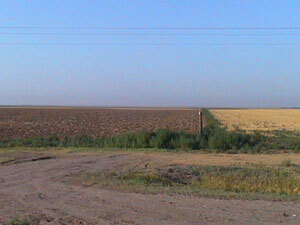 The picture below shows two fields shortly after harvest. The left field had corn and the right field had wheat. We met up with a group of four riders about half way through the day. It is common courtesy to stop and talk to all other riders to share information. They are actually two pair of riders but have been travelling together for a week or so. The two riders in the foreground and facing left are Geert and Joe, my riding companions. The rider to the far left and far right are together and the other two riders make the other pair. The guy on the far right has a tremendous amount of cycling experience. He cycled around the world from 1986-88 and this is his third cross country trip. He's riding a 23 year-old Trek road bike that has accompanied him on every journey. The only parts that are original to the bike are the frame, seatpost, and handlebars. The second pair is towing BOBs and they say that I'm the first recumbent they have seen since they started. I have yet to see another recumbent but I hear that there is one 'bent rider a day ahead of us. They let us know that the next few days will continue to be dry, hot and dusty. The rest of the ride in the mountains should be just beautiful. We shared with them information about the bridge that is out about three days ahead. I think I may have figured out some of the symbolism in The Wizard of Oz. The Emerald City may refer to either the lush Flint Hills or to the hope that rains make the crops nice and green. The tall building in the Emerald City is most certainly a reference to to the huge grain elevators that stand in the middle of every town in Western Kansas. After all, the story takes place in Dorothy's dream so she must have been familiar with all the things in that dream. I'm in the mountain time zone now and look forward to reaching the Colorado border early tomorrow morning. It's only sixteen miles from where we're staying. We got a motel again today to beat the heat and have a nice shower. It's great to split the cost three ways. The town of Tribune is named for Horace Greely's New York Tribune. The people around here recognized that Greely was a friend to farmers and ranchers so they named the county Greely, the county seat Tribune, and another nearby town is called Horace. 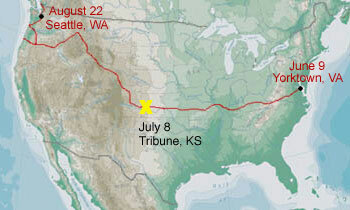 We hit a milestone today by reaching the Mountain Time Zone. I saw some dust devils off in the distance but none reached the road that I was riding on. The last ten miles of the ride were very tough since they had just finished paving it with blacktop. Talk about hot riding on a sunny, 95+ degree day! A guy who lives here at the motel was grilling chicken and corn and offered some to us. It tasted really good. The seat frame has worn a hole in the mesh seat back on my bike. The hole started pretty small about a week ago and grew steadily so I took the seat apart, sewed the mesh back together as best I could, put some duct tape on the sharp metal on the seat frame, and zip-tied it back together. I hope it holds well. Otherwise I'll have to take it apart again and do a more complete job.